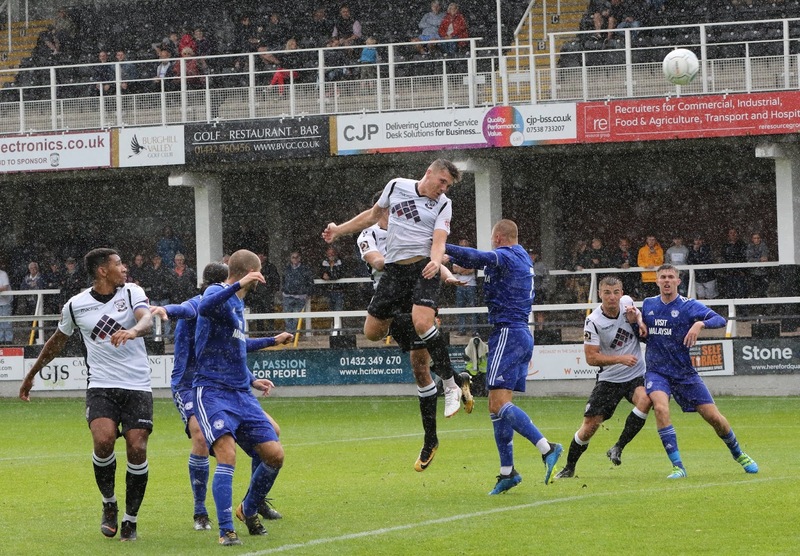 Hereford FC played their final pre-season friendly this afternoon at Edgar Street. 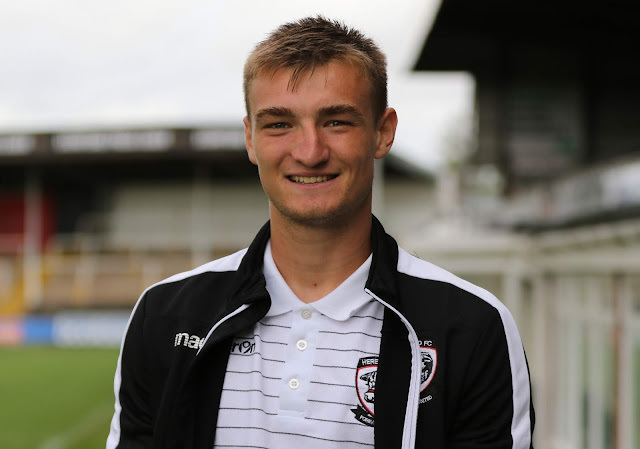 Harvey Smith made his debut for the club partnering Ryan Green in defence. It was a tough game for the Bulls against a Cardiff City XI with a number of players with experience in their first team. Three of the players who've more recently been out on loan, Matthew Connolly, Anthony Pilkington and Stuart O'Keefe, have 278 first team appearances between. 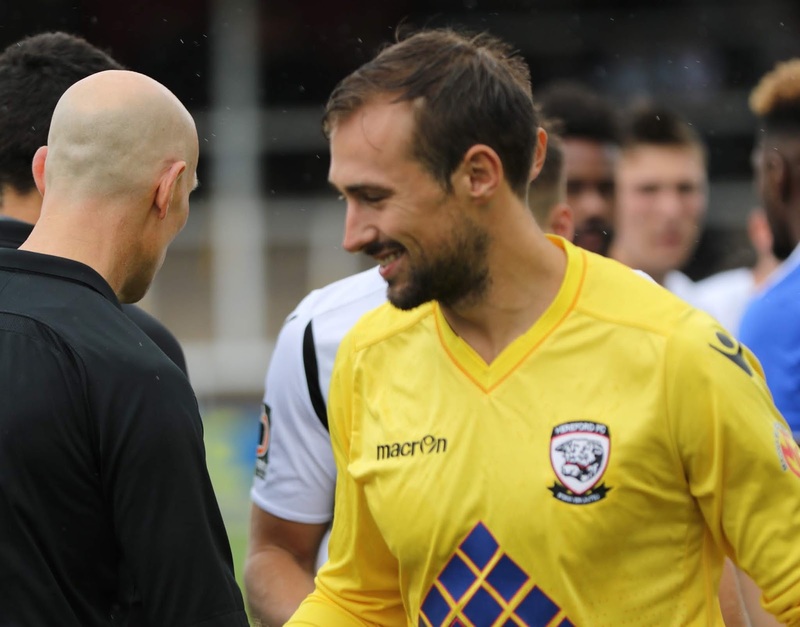 Hereford had their fifth keeper of the season start in goal this afternoon, as Dean Lyness was named on the team sheet. 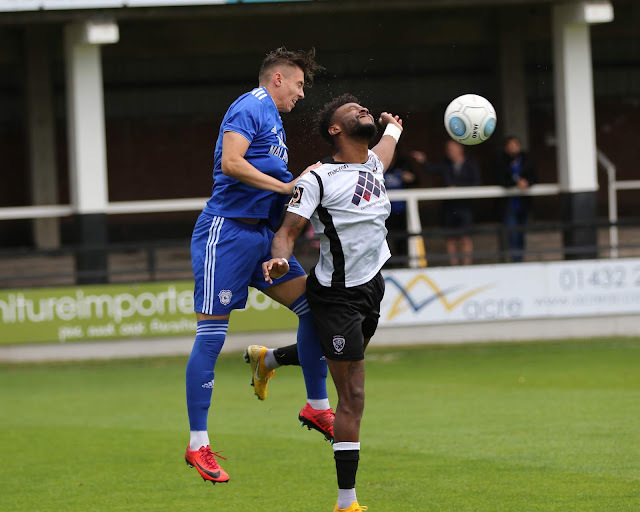 He spent last season at National League North Side Nuneaton, as well as having clubs like Kidderminster Harriers, Burton Albion and Blackpool to his name. 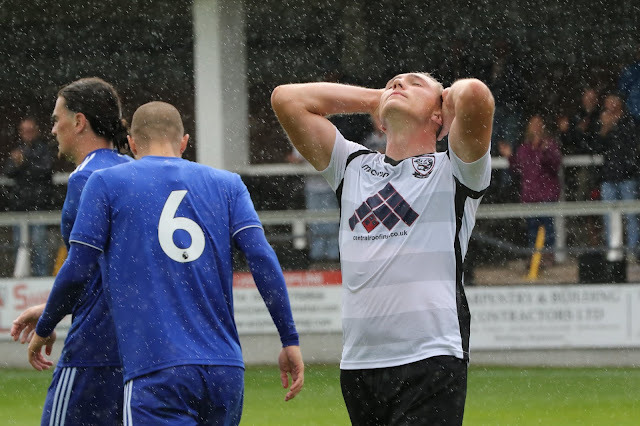 At a wet Edgar Street, which groundsman Ben Bowen must be very pleased about, Hereford had the first real chance of the game as Jennison Myrie-Williams was brought down 25-yards out. The energetic Jamie Bird stepped up, but the ball just crept over the crossbar with goalkeeper Lee Camp untroubled. Anthony Pilkington was the man responsible for Cardiff's first shot, but his powerful effort after cutting into the box was deflected behind by Ryan Green. Hereford's trialist keeper was less than convincing after he completely missed the ball after rising to punch it clear, but thankfully nobody was well-placed to stab the ball home. 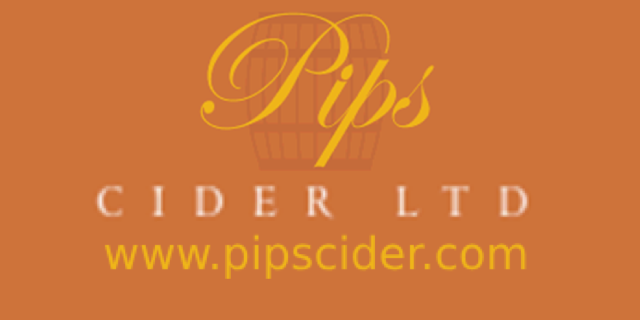 Back down in front of the Blackfriars End, another foul on Marie-Williams saw Jamie Bird with another chance to open the scoring in the 20th minute. From a tight angle on the left, Bird whipped the ball into the box, but it was headed clear just as it started curling towards goal. Two goal worthy chances for the Bulls followed either side of a fingertip save from Lyness denied Pilkington. With 23 minutes on the clock Myrie-Williams saw his shot drift just wide off the far post, before Harry White repeated the trick six minutes later after being played into space by Jamie Bird. 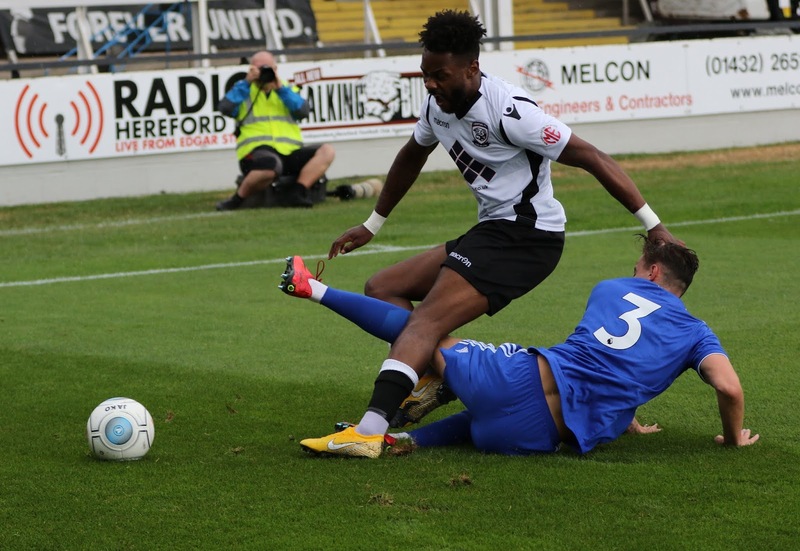 It was a decent first half performance from Hereford with two headed efforts from captain Ryan Green before half time, but it wasn't enough to break the deadlock. As the rain continued to last down at Edgar Street, seven minutes after the restart Cardiff took the lead. 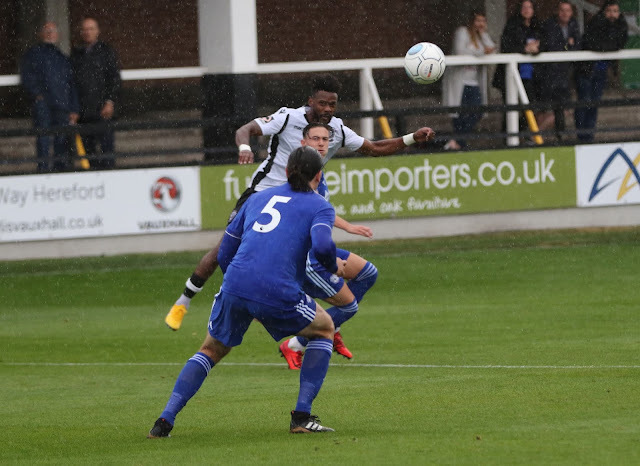 It turned out to be an easy goal for the visitors, after Kadeem Harris' beat Keiran Thomas to the ball, his cross found the head of the unmarked Omar Bogle to head home. In response to the opener, Eliot Richards battled to win possession in the middle of the park before playing the ball through to his midfield partner Mike McGrath, but his shot sailed over. 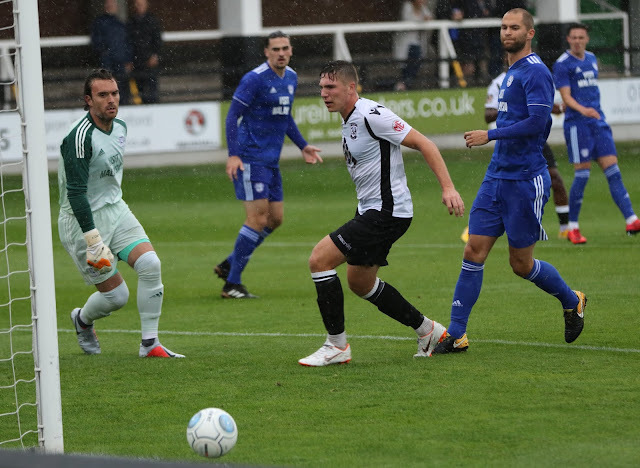 After holding their own for the first half, it was disappointing to see Hereford concede again in the 66th minute. After a trio of changes, a lapse in concentration effectively gifted Cardiff the goal. 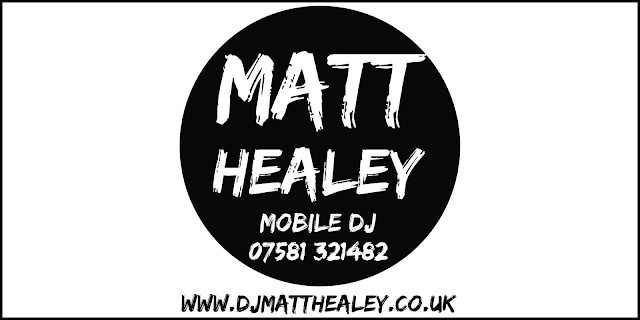 Callum Sainty was guilty of losing the ball in midfield, allowing Lee Tomlin to set up £1million striker Anthony Pilkington to fire the ball home from within the box. Having arrived at Edgar Street on a one month loan deal from Bristol City, Harvey Smith had a decent chance to score his first goal in a Hereford shirt. After getting on the end of Billy Murphy's corner, Smith saw his header from close-range go wide of Camp's goal. 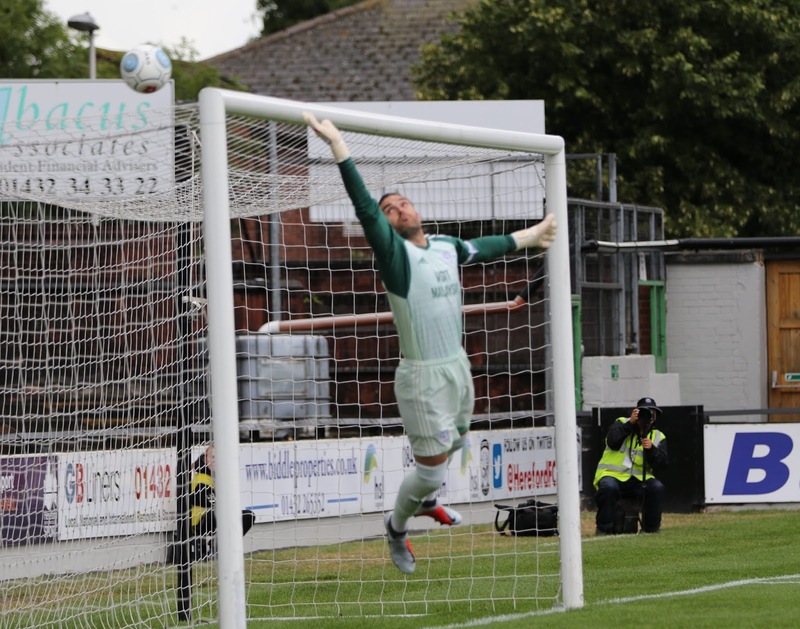 Quick reactions from keeper Dean Lyness kept the deficit at just two goals, after managing to palm away a 25-yard shot from substitute Rhys Healey. However the Bluebirds added their third and final goal in the 90th minute courtesy of Rhys Healey. After playing a smart one-two with Anthony Pilkington, it was an easy tap-home for the 23-year-old. It couldn't be said that Hereford were totally out of their depth today, it's just a case of Cardiff taking advantage of one or two pieces of poor defending and making the most of the chances they had. Overall it was a game with plenty of positives for Hereford, having lost 5-1 to probably a weaker Cardiff side last summer. Cardiff City XI: Camp, P. McKay, Coxe, Waite (Veale - 43'), Brown (Bodenham - 75'), Connolly, Pilkington, O’Keefe (Evans - 46'), Bogle (Healey - 60'), Tomlin, K. Harris (M. Harris - 81'). Sub not used: J. McKay.